The San Francisco de los Andes breccia-hosted deposit (Frontal Cordillera, Argentina) is characterized by complex Bi-Cu-Pb-Zn-Mo-As-Fe-Ag-Au mineralization. After magmatichydrothermal brecciation, tourmaline and quartz partially cemented open spaces, followed by quiescent periods where Bi-Cu-Pb-Zn ore formed. Bismuth ore precipitation is characterized by Bi-sulfides, sulfosalts, and tellurosulfide inclusions, which temporally co-exist with Ag-telluride inclusions and chalcopyrite. Three distinct Bi mineralizing stages have been defined based on the following mineral assemblages: (1) Bismuthinite (tetradymite–hessite inclusions); (2) Bismuthinite (tetradymite–hessite inclusions) + cosalite (tetradymite inclusions) + chalcopyrite; and (3) Cosalite (tetradymite inclusions) + chalcopyrite. Overall, Ag-poor bismuthinite hosts both Bi-tellurosulfide and Ag-telluride inclusions, whereas Ag-rich cosalite only hosts tetradymite inclusions. In this study, we discuss the effects of temperature, pressure, vapor saturation, salinity, acidity/alkalinity, and redox conditions on Bi-rich mineralizing fluids. Evolving hydrothermal fluid compositions are derived from detailed paragenetic, analytical, and previous fluid inclusion studies. 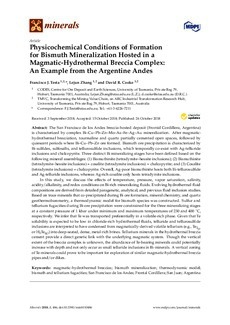 Based on trace minerals that co-precipitated during Bi ore formation, mineral chemistry, and quartz geothermobarometry, a thermodynamic model for bismuth species was constructed. Sulfur and tellurium fugacities during Bi-ore precipitation were constrained for the three mineralizing stages at a constant pressure of 1 kbar under minimum and maximum temperatures of 230 and 400 °C, respectively. We infer that Te was transported preferentially in a volatile-rich phase. Given that Te solubility is expected to be low in chloride-rich hydrothermal fluids, telluride and tellurosulfide inclusions are interpreted to have condensed from magmatically-derived volatile tellurium (e.g., Te2(g) or H2Te(g)) into deep-seated, dense, metal-rich brines. Tellurium minerals in the hydrothermal breccia cement provide a direct genetic link with the underlying magmatic system. Though the vertical extent of the breccia complex is unknown, the abundance of Te-bearing minerals could potentially increase with depth and not only occur as small telluride inclusions in Bi-minerals. A vertical zoning of Te-minerals could prove to be important for exploration of similar magmatic-hydrothermal breccia pipes and/or dikes.